Advances in medical robotics help people heal more quickly from surgery. These robots are not autonomous; they are telefactoring devices, meaning that they are used under the direct supervision of expert surgeons or other operators at all times. The da Vinci Surgical System is one example of a growing class of devices that help surgeons do their best. A 2004 University of Michigan study noted that patients who were operated on with robotic surgeon assistance recovered more quickly with fewer or less obtrusive scars. See Robot-assisted surgery for young heart patients reduces hospital stay, pain, scarring and healing time for more information about this remarkable advance. In his outstanding 1999 novel Starfish, which details life in a deep sea habitat, author Peter Watts details an amusing encounter with a medical mantis, a remote telefactoring system operated by a physician on the surface. 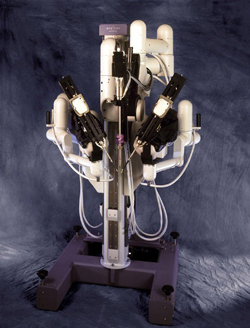 You might also find How Robotic Surgery Will Work interesting.